A clear color palette makes your graphics both visually appealing and easy to read. Usually data type plays the strongest role in my color selection method, but I also consider what type of document it will be included in and who is likely to read it. There are two main types of data I present: categorical or continuous. Examples of categorical data on a map include land cover type, tree species, or watershed. Generally for categorical data, each category gets its own color. Contrasting colors like blue next to orange can make the categories easier to tell apart, but similar colors can give your map a more cohesive look (think blue with indigo). I like this map (available at the link and above) because the colors group similar land cover types and help distinguish prairie from other types. The three different prairies are visually grouped, but have sufficiently distinct shades of green for easy readability. 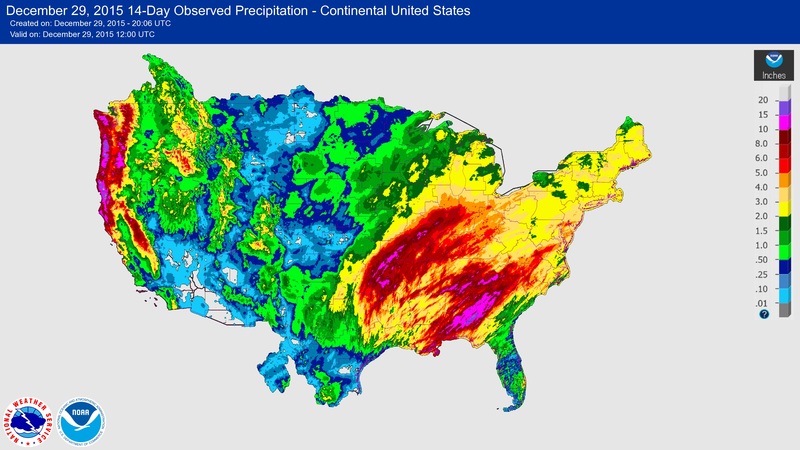 Rainfall maps use continuous data. Generally a darker color means “more” and a lighter color means “less,” and usually we think of these colors as falling on a gradient. Frequently I map colors on a white-to-red or white-to-green gradient, but for some data with a really large spread it helps to have a spectral gradient. The rainfall map to the left illustrates a common technique to make maps easier to read for some applications: it makes categories out of the continuous data, like the mapping equivalent of a histogram. Relative probability is a special type of continuous data that is best displayed with a diverging gradient. A diverging gradient has one color on each end and a contrasting neutral color in the middle, like blue to white to red. This paper about elephant resource selection includes some great maps (scroll all the way to the appendices to see a bunch), including the relative probability map displayed to the right. Note that clicking the animation won’t work from this site– you need to go to the video URL between the map and the caption. Realistically, many maps you make will have a combination of continuous and categorical data on them. The map below (made by Doug Sponsler for a paper available here) shows honey bee foraging probability, a continuous variable, over two different land use classifications, a binary category. This map is fairly simple in that the two land use categories are not mixed together, so the transparent grey shadow over the urban landscape is effective. The unobtrusive backdrop makes it easier to read and interpret the overlaid probability cloud. If you’re having trouble deciding what sorts of colors to use on your next map, I highly recommend checking out the ColorBrewer project from Penn State University. Cindy Brewer has created an extensive list of palettes for all sorts of data and number of categories, and literally wrote the book on the topic (Designing Better Maps: A Guide for GIS Users). There’s even a web tool for you try out palettes on an example map! My favorite part of the ColorBrewer palettes is their color-blind and printer friendly designations. For presentation slides I lean towards color-blind friendly options, and I like using printer friendly palettes for handouts. If you’re an R user, check out the package RColorBrewer. Consider the above a starting point for making readable maps and graphics. If this seems basic, or if color alone isn’t helping you get images you’re satisfied with, try playing with transparency and line widths. These tools can also be useful for graphs that present non-spatial data, which I’ll hopefully get the chance to write about soon!